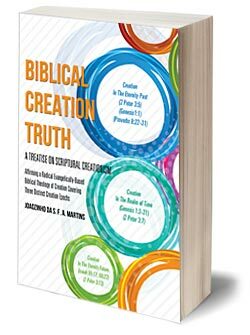 “BIBLICAL CREATION TRUTH” is a treatise on Scriptural Creationism covering three distinct creation phases or eons. It differs from the traditional and recent controversial theories of creationism. Contrary to the prevailing confusing theories of creation, the “heavens and earth“ of Genesis 1:1 were perfect (Deuteronomy 32:4) and definitely very beautiful (Ecclesiastes 3:11). Genesis 1:1, therefore, in just one short blessed sentence, covers within its grasp the ‘totality of a perfect primal creation’. This fact is substantially corroborated by Proverbs 8:22-31, narrating the primeval creation. Notwithstanding prevailing interpretations, in no way, Proverbs 8:27-31 are parallel with Genesis 1:3-31 account of creation, but actually complement the independent Genesis 1:1 account of creation with additional details. Next, Proverbs 8:27-31 does not mention chaos on the primeval earth thereby proving that the chaos of Genesis 1:2 was of a much later occurrence. Moreover, notwithstanding any unjustified denial, Proverbs 8:26c-31 prove that the original earth was teemed with life, including pre-adamic ‘sons of men‘ in whom God’s Wisdom delighted. With the exception of only those elect ones who are in Christ [Deuteronomy 10:15], God is never spoken of as taking delight in the fallen un-regenerated ‘sons of men‘ at any time. Subsequent to Adam’s fall, man’s heart has been evil all along and desperately wicked [Romans 3:9-18]. Sinful fallen un-regenerated ‘sons of men‘ at any time, have never been and could never be delightful but rather wholly abhorring and very loathsome to a holy God [Psalms 53:1-3]. As such, the “sons of men” mentioned in Proverbs 8:31, in whom God’s Wisdom took delight, definitely had to be “pre-adamic sons of men“, and not the fallen adamic sons of men. Undoubtedly, Proverbs 8:27-31, in a way, conclusively establishes the existence of pre-adamic life on earth of Genesis 1:1. Undoubtedly, a faulty interpretation of Genesis 1:1-31 and Exodus 20:11 lies behind the ‘battle for a true view of the beginning‘. If these Scriptures, along with Proverbs 8:22-31, were objectively interpreted, taking into account Genesis 2:4 relating to ‘Beginnings’, it would be clear that there were two beginnings of God’s works of creation; one, in the eternity past (2 Peter 3:5), and the other, in the realm of time (2 Peter 3:7), leaving no room for any debate relating to the origins or the age of the universe. Notwithstanding any biased opinions about the Gap Theory, in between the two historical beginnings we have sufficient Scriptural ground to account for Pre-historical Pre-Adamic Life on the primeval earth of Genesis 1:1; and, its subsequent destruction as is evident from Genesis 1:2 and related Scriptures, followed by a reconstruction of the chaotic earth and restoration of life on it in six days [Genesis 1:3-31]. Scriptures as well as geological findings provide sufficient basis to formulate Pre-historical Pre-Adamic Theology. Accordingly, the controversial Gap Theory based on the ignored <Gap> between Genesis 1:1 and 1:3 can be conveniently replaced by relevant Biblical Gap Theology as is confidently and convincingly attempted in this maiden treatise. The current debates relating to the ages of the universe or earth are, undoubtedly, futile exercises displaying gross human ignorance through guesses which are but fruits of sinful intellectual vanity. God emphatically says ‘no man can ever really find out about His works‘ [Ecclesiastes 3:11]; or, about the nature of origins, or about the age and composition of the universe. As such, all human effort to probe into the unseen is a sheer exercise in futility! No wonder fallible human theories based on mere speculation keep on mutating! It’s time we admit our failure to consider all the Scriptures relating to creation, and interpret biblical creation accounts appropriately! And next, with faith, come to grips with the revealed Biblical Creation Truth, for ‘His Name’s sake‘; even as we look forward to the creation of new heavens and a new earth in the etemity future (2 Peter 3:13). Obviously, the new heavens and earth will not be ‘created‘ through the course of billions of years of some vague evolutionary processes, nor in six days, but almost instantly by fiat! The prophesied future instant creation of new heavens and earth should rule out, once for all, past creation of the original heavens and earth of Genesis 1:1 and Proverbs 8:22-31 in six days as is believed and taught contrary to Biblical and Natural Revelation by the Traditional and the more recent Young Earth Six-Day Creationists. Book Reviews:> Dr. Steven E. Dill, D.V.M., Author of ”In The BEGINNINGS“! Related Links:> Gap Theory Alliance ; Answering Objections to the Gap Theory ; The Bible:Genesis and Geology; Creation, Science and Genesis 1; Pre-Adamic Creation-Genesis Gap; Discovery Institute ; Intelligent Design; Creation Truth -Compelling Evidence .